Not far from Tahrir Square Cairo’s Mohamed Mahmoud Street is an artistic testament to the region’s past and ongoing struggles. Mohamed Mahmoud Street is where the heavy white smoke of tear gas suffocated hundreds of young people while dozens of motorbikes carried the injured to the field hospitals set up in Tahrir square. Mohamed Mahmoud Street is where rubber bullets targeted protesters’ eyes, and where, according to the evidence provided by the protesters, live ammunition was used against them (though the minister of interior denied that forces had fired any kind of ammunition). 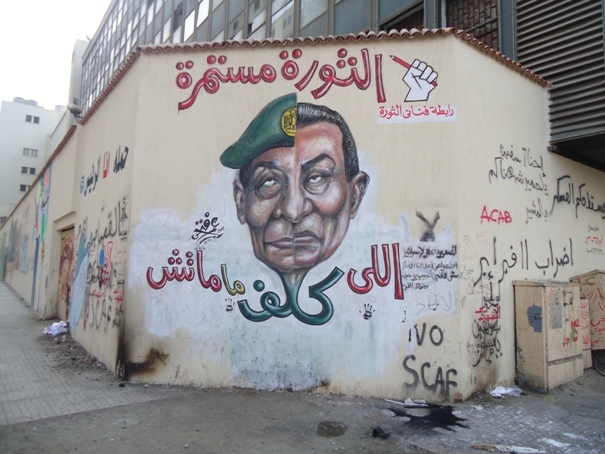 It was also Mohamed Mahmoud Street that witnessed the erection of the 13 feet tall concrete barricade, the first out of eight walls that were later built in the neighboring streets. Together with a number of barbed wires, the aim of the walls was to block access to the Ministry of Interior, in close proximity. 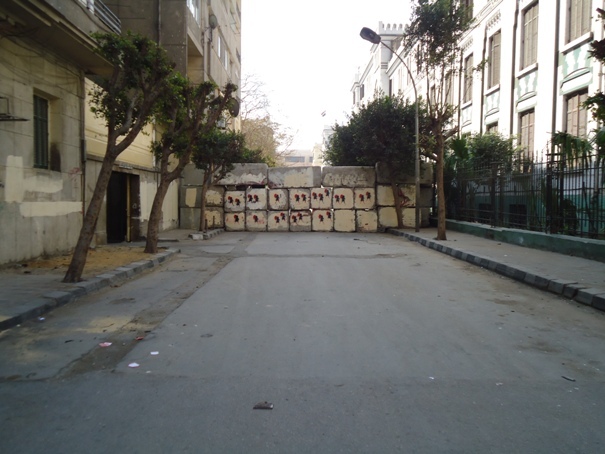 Following the demands of its residents, on 17th February Mohamed Mahmoud street’s barricade was removed, though the seven others remain until today. Mohamed Mahmoud Street leads from Tahrir Square towards Cairo’s Downtown and runs between the Northern wall of the American University in Cairo (AUC) on one side and a chain of food outlets and the old AUC Library on the other. Neighborhoods that used to be populated by financially privileged students turned into a battle field between the Central Security Forces (CSF) and young people fighting for a better tomorrow, dignity, rights, freedom and justice. Stage to many protests and demonstrations over the last few months, Mohamed Mahmoud Street has become as equally iconic as Tahrir square. The street especially came to light between November 2011 and February 2012, by becoming one of the main locations of violent clashes between the protesters and the CSF. In November 2011 over 40 protesters died in the street and one thousand were injured, according to the Egyptian Ministry of Health. Today, hardly a couple of weeks after the clashes, Mohamed Mahmoud Street has transformed into an open air gallery. In the last days of February, walls of the AUC campus and the library became canvases for the most painful, honest and equally artistic paintings. 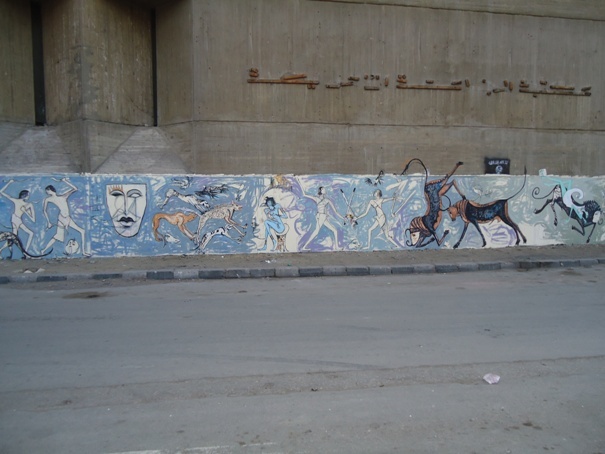 Port Said martyrs – victims of the 1 February football violence – look out at passersby from the large portraits covering the AUC campus wall. 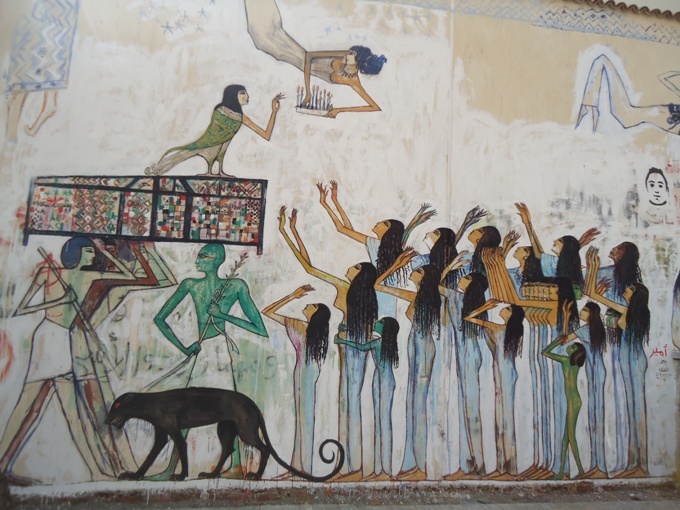 As you continue walking humbled by their pride and eternal silence, you find metaphorical depictions of a funeral and the mythological path to heavens; painted scenes borrow motifs and technique from the Ancient Egyptian art. The role and strength of women, yearning for justice, are among several social and political messages that steal our attention and incite long-lasting impressions. 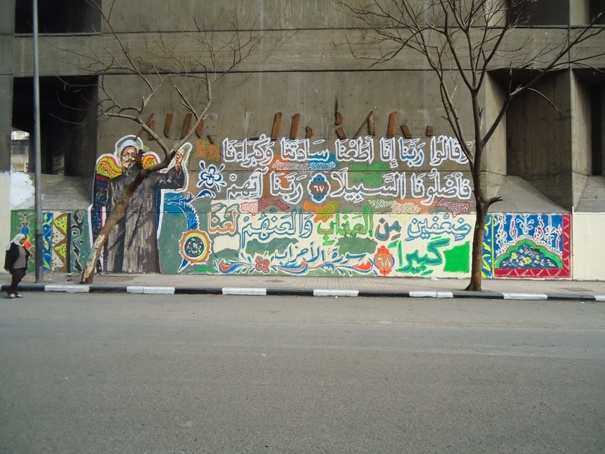 Further on, on the library wall, a large representation of Sheikh Emad Effat, an Islamic scholar, killed by military police during the protests, is surrounded by verses from the Quran. 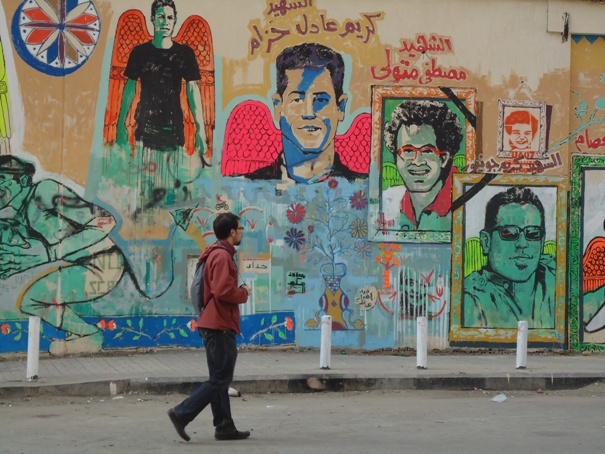 It is not the first time for Mohamed Mahmoud Street to serve as canvases for graffiti artists. Sporadic stencils and spray works were usually duly removed from the walls and concrete blocks serving as barricades. Large paintings that cover the street today mark a crucial development in the street art in the area. Since the beginning of the revolution, simple stencils, then more elaborated graffiti, kept voicing concerns and became commentaries of the realities; whilst all the artwork juggles between irony and sincerity. 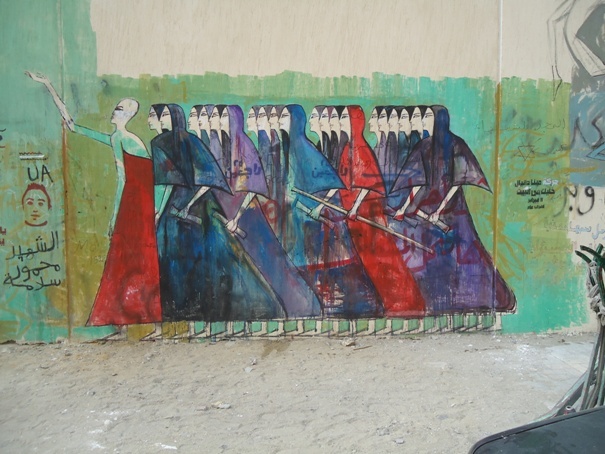 With first works appearing still during the initial 18 days that toppled the former president Hosni Mubarak, street art started radiating towards many Cairo districts. Graffiti at Mohamed Mahmoud Street underscore a step in liberation of artistic forces, however their thematic content testifies to the aching reality and on-going struggles.